Hey Northeast Valley Health Corporation employees: Our rally is getting results! 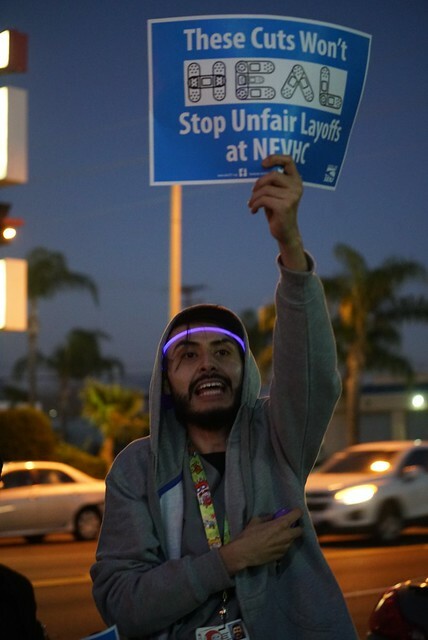 We held an after-hours Union Rally for Quality Patient Care last week and now NEVHC management has asked to meet with us to find a way to mitigate plans to layoff workers and reduce employee hours! We know how valuable frontline healthcare workers are to our community and that unfair staffing cuts like these will only decrease quality care. We’re making progress but will need to continue standing strong! Our next action will be a vigil during a meeting for the NEVHC executive board on Tuesday, Feb. 12 from 5 p.m – 7 p.m. If you haven’t already, text SEIU to 31966 so you will get the latest updates and developments. These cuts won’t heal and we won’t stop fighting for our affected SEIU 721 brothers and sisters. When we fight, we win!